Our Organic Search team has been relentlessly testing to determine the impacts of Google's recent algorithm update. Check out what they discovered! Google rolls out search algorithm updates on a daily basis. Most of the time these updates are minor, but every so often, a substantial update occurs that notably impacts search results. When these updates roll around, Team Convertus is prepared to test relentlessly and investigate how these changes impact your organic ranking. In July 2018, Google pushed out an update making page speed an organic ranking factor for mobile searches. The update suggests that websites with quick load times for mobile searches are given a boost in the SERP and experience improved SEO. Put simply, the speed at which your mobile website’s pages load could now influence your dealership’s position in the SERP. We conducted a series of tests to determine how the update impacted automotive website rankings. So, do you need to optimize for mobile page speed? It’s probably still a good idea. But our test results suggest that it’s not an immediate priority, as mobile speed isn’t a dominant ranking factor (yet), even with Google’s recent update. There was not a powerful correlation between mobile page speed and ranking between rounds one and two. This means that dealership websites may still rank well in the SERP even if they’re not optimized for mobile speed. Other signals that influence rank (think content relevancy, recency, domain authority and so on) are still more powerful and remain the leading drivers for automotive search results. Does this mean you should ignore page speed? Definitely not! While the rankings may favor the fastest websites, users are still impacted by a slow website. It makes for a poor user experience, which can be detrimental to your conversions. If users are tired of waiting for your website to load, they’ll leave! So aim to keep your website fast for users, not just for Google. 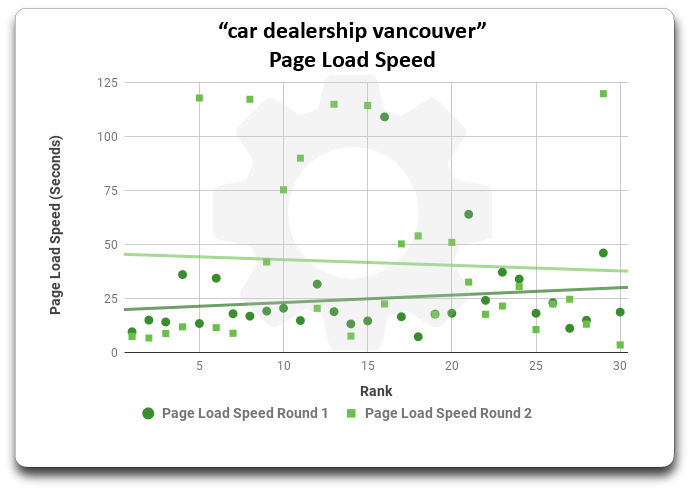 In this scatter plot graph, you can see the comparison between rounds one and two of page load speeds for the keyword “car dealership vancouver”. We compared the rank position for the top 30 search results between rounds one and two. The variation is minimal, but the second round indicates a slight decrease in page load speed within the top search results. In general, the mobile speed update did not significantly impact ranking. Prioritize mobile page speed. Our testing indicated that the number one ranking spot in the SERP had improved mobile page speed, which means one of two things: 1) The top-ranking website has focused on optimizing mobile page speed or 2) Google ranks mobile sites based on their ability to load quickly. Either way, if your dealership craves that highly-coveted number one position, mobile page speed optimization should be a focus. We also noticed that the top ranking websites belonged to fairly large businesses, meaning that they likely have the resources to invest in increasing page speed. 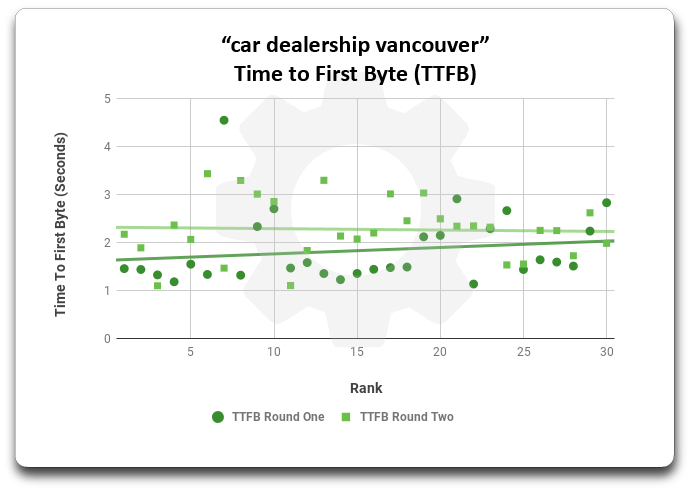 This graph shows time to first byte for the keyword “car dealership vancouver”, compared between rounds one and two. Believe it or not, time to first byte isn’t how long it takes you to dive into a cheeseburger from the moment it’s placed in front of you. It’s the initial waiting time that begins once a website has been clicked in the SERP. We measured the TTFB for all nine keywords (in all three cities, too) and determined that, similar to page load speed, there was no strong correlation between TTFB and rank. 3. There’s consistency in the top search results. Many of the top-ranking websites in our testing remained consistent in their positions throughout rounds one and two. Approximately 65% of URLs in the top 30 search results held their position between tests, while between 65 and 85% held their position in the top 10 results. These are the average page load speeds for the top-ranking automotive websites between rounds one and two. Note that these page load times aren’t universal, because factors like network connectivity and device type have to be considered. According to Google, 70% of mobile network connections will happen through 3G (or even slower speeds) through 2020, so for testing purposes, we chose not to use a top-of-the-line cell phone. Instead, we chose to run tests through a Motorola Moto G4 Android with a 3G connection. This gave us a consistent baseline to work from. The mobile speed update was a little too hyped! Accelerating mobile page speed is a growing trend that everybody’s been talking about, but it’s mostly buzz (for now). When it comes down to impact, the results are miniscule. Despite the minimal impact, automotive websites should still consider investing in SEO. Our testing confirmed consistency within the top-ranking search results. Over half of the websites tested remained in the top results both rounds, which indicates that if you’re investing in SEO, there’s a high chance of maintaining (if not improving) your position in the SERP over time! If you’re unsure about your website’s current mobile speed, Think With Google offers a free tool that allows you to test mobile page speed by simply pasting in the URL. Here at Convertus, our responsive websites are built with Google’s mobile-first index in mind. 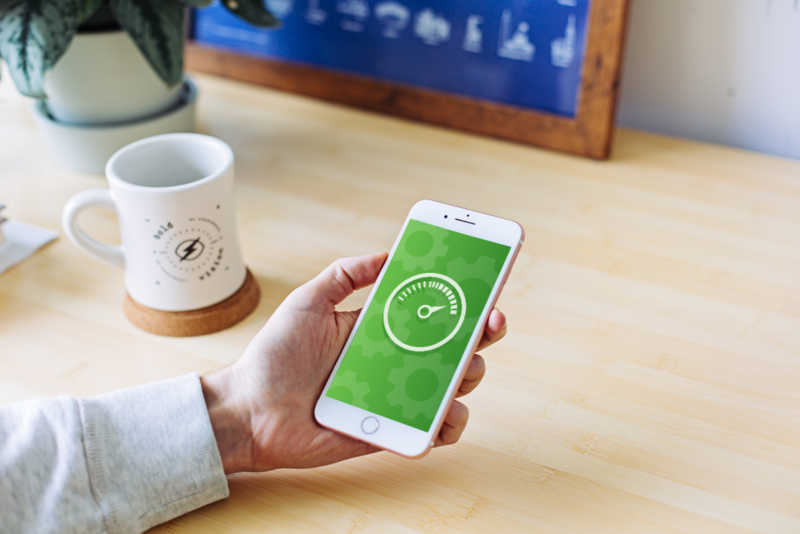 We’re masters of optimizing relentlessly for mobile page speed, too. If you’re ready to fight for that number one position in the SERP, or if you just want to start a conversation to determine the best move for your dealership, reach out to our Customer Success team and let’s talk mobile.